Studies documenting distributional shifts of fishes typically rely on time series of annual sampling events with fixed seasonal timing and limited temporal range. Meanwhile, as temperatures along the Northeast continental shelf have increased, the seasonal cycle also shifted towards earlier spring warming and longer summers. Seasonal migrations of fish and macroinvertebrates on the continental shelf in the Northeast US are thought to be primarily controlled by temperature and as such likely follow the temperature phenology of the shelf. 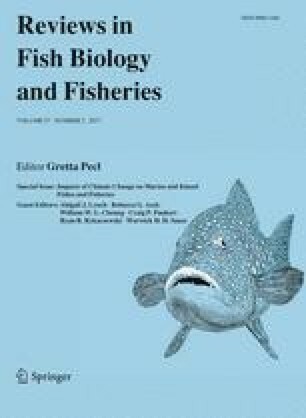 This study sought to determine whether apparent changes in fish biomass and distributions are linked to spring warming phenology and/or duration of summer, the effective growing season for most species. We hypothesized that the earlier spring thermal transition would occur earlier and would cause centers of biomass to be more poleward during the spring survey. We also expected lengthening summers, primarily a function of later fall cooling, to cause centers of biomass in the fall survey to be more poleward and for biomass on the shelf to be greater within and following longer growing seasons. We did not detect a strong effect of the timing of the spring thermal transition in sea surface temperature on the distribution or abundance for most of the 43 fish stocks that we examined. However, later fall cooling and longer summers had a strong effect on both abundance and biomass of many fish stocks. These findings suggest that more focus should be placed on the length of the growing season and population-level processes that result in distributional shifts and changes in abundance. The online version of this article (doi: 10.1007/s11160-017-9487-9) contains supplementary material, which is available to authorized users. The authors would like to thank the National Science Foundation for funding OCE-1325484, part of the Coastal SEES program. And Sean Lucey and Haikun Xu for answering questions about the data. We also thank the National Oceanic and Atmospheric Administration (NOAA) Northeast Fisheries Science Center (NEFSC) Ecosystems Surveys Branch for conducting the trawl survey.